Read our most impactful Inorganic Materials papers of 2017! Inorganic materials and nanoparticles are being applied to many of the most pressing challenges facing humanity in the 21st century. They are currently being investigated for their applications in batteries, solar cells, photocatalysts for water splitting and pollutant degradation, and medical theragnostics. Here are some of the most impactful papers in solid state inorganic chemistry from Dalton Transactions in 2017. These Frontier and Perspective articles are receiving a lot of attention online, reviewing the advances and trends that are making waves in the solid-state inorganic chemistry community. This review summarizes thioborates and their structural motifs ranging from zero-dimension to three-dimension. The most commonly observed building units of these examples are planar-triangle BS3 and tetrahedron BS4. Thioborates possess advantages with respect to their structural diversity, optical nonlinearity, laser-induced damage threshold and transparency range, and represent potentially a rich supply of new nonlinear optical materials. This Perspective highlights recent chemical approaches to perovskite solar cells, including the control of electron-transporting mesoporous TiO2 and the utilization of nanocarbon materials. This Frontier article will highlight recent advances in engineering the composition and structure of TMPs for higher water electrolysis performances. This original research is off to a great start, as some of our most cited work these papers and communications are already being recognized by the nanomaterials and solid-state chemistry community. A novel BiOI/CeO2 photocatalyst with high photocatalytic performance was successfully synthesized via a facile in situ precipitation method. The enhanced photocatalytic performance is ascribed to the formation of a p–n junction, which promotes carrier separation. Herein, we evaluated an all-inorganic perovskite based MSM photodetector employing a bilayer composite film of mp-TiO2 and CsPbBr3 quantum dots as a photosensitizer. A novel alluaudite, Na2+2xCo2−x(SO4)3, has been unveiled as a potential high-voltage (ca. 4.8–5.8 V) sodium battery cathode demonstrating antiferromagnetic ordering. Submit your research or reviews on Solid State Inorganic Chemistry and Nanomaterials to Dalton Transactions – see our author guidelines for information on our article types or find out more about the advantages of publishing in a Royal Society of Chemistry journal. 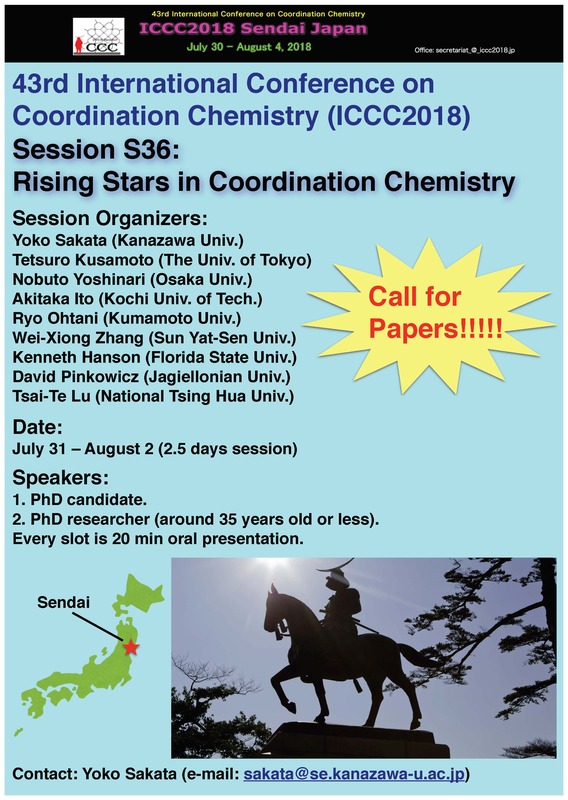 This year’s International Conference on Coordination Chemistry (ICCC2018) is being held in Sendai, Japan, from July 30th – August 4th and features a ‘Rising Stars’ session aimed at PhD students and early career researchers. 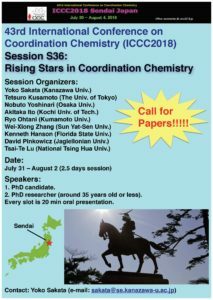 If you, or someone you know, is a Rising Star in Coordination Chemistry see the flyer below for further details. 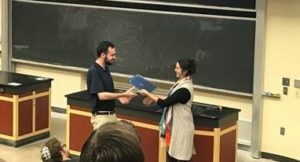 Congratulations to the poster prize winners at the Ohio Inorganic Weekend! 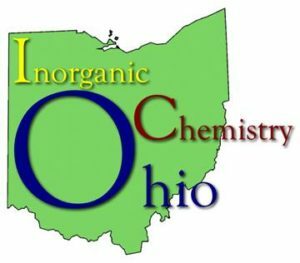 Last month saw the occasion of the Ohio Inorganic Weekend (OIW), which brings together researchers of inorganic chemistry from across the Midwest. Organised and hosted by Dr Hannah Shafaat (Ohio State University) and featuring 20 oral presentations and 119 posters on a diverse range of topics, including catalysis, organometallic and bioinorganic chemistry, and solid-state materials, the event was a huge success. 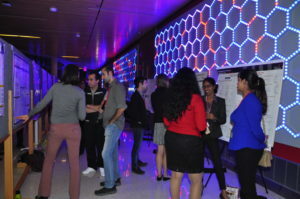 The relaxed setting enabled undergraduate and graduate students to present and discuss their work, frequently for the first time outside their home institution, and provided an excellent venue for initiating collaborations. 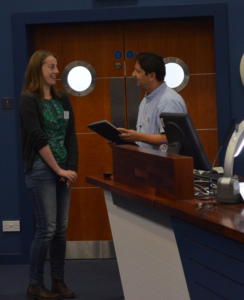 The RSC was on-hand to award poster prizes to the best student poster presentations. For more information about the OIW, including a full list of presentations and pictures of the poster session visit the conference page on the Shafaat Research Group website. Dalton Transactions offers a huge congratulations to all poster prize winners! 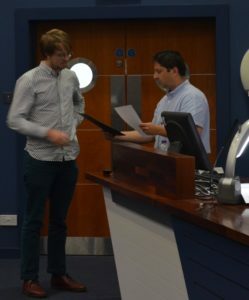 Dalton Transactions awarded Daniel Delony (University Göttingen) and Malte Fischer (University Oldenburg) poster prizes for their work at the 20th North German Doctoral Colloquium 2017 (Norddeutsches Doktoranden kolloquium 2017) which took place in Kiel, Germany from the 21st – 22nd September 2017. The event aims to promote a productive exchange of ideas through lectures and poster presentations among the doctoral students from the Inorganic Chemistry working groups. Current research such as bioinorganic chemistry, organometallic and inorganic synthesis and catalysis are discussed as well as the fields of inorganic solid-state chemistry and materials science. Further information about the conference can be found by visiting the webpage. 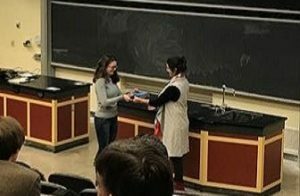 Congratulations to the GFSM prize winners! Earlier this year the 39th international meeting of the French Speaking Mössbauer Society (Groupe Francophone De Spectrométrie Mössbauer) was held in Béni-Mellal, Morocco. The conference was organized by Prof. Mohammed Sajieddine from the University Sultan Moulay Slimane and gathered 78 participants with 42 contributions (15 talks and 27 posters) including Invited speakers Prof. Hiroki Oshio (Univ. of Tsukuba), Prof. Abdelilah Benyoussef (Acad. Hassan II Sci. Techniques, Rabat, Morocco), Dr. Moulay Tahar Sougrati (Univ. Montpellier II, France) and Prof. Stanislaw Mieczyslaw Dubiel (AGH Univ. Sci. Tech., Krakow, Poland). The meeting was centered on the input of Mössbauer spectroscopy in solid state chemistry and physics with a special emphasis on nanomaterials and current trends and applications of the technique. Delegates came from France, Belgium, Portugal, Tunisia, Algeria, Morocco, and Ivory Coast. A Mössbauer school was organized prior to the conference with invited lecturers Dr. Jean Marc Grenèche (Le Mans Univ. ), Dr. Mustapha Abdelmoula (Univ. of Lorraine) and Dr. Jean Juraszek (Univ. of Rouen). The event, which was held for the first time in North Africa, was a great success. It gathered scientists either using or interested in the Mössbauer technique to discuss the latest trends and advances. The GFSM, chaired by Prof. Yann Garcia (Université catholique de Louvain, Belgium), organizes this meeting every year. Previously the meeting has been held at Le Mans (2016), Jülich (2015), Montpellier (2014), Nancy (2013), Rouen (2012), Strasbourg (2011) and Lisbon (2010). 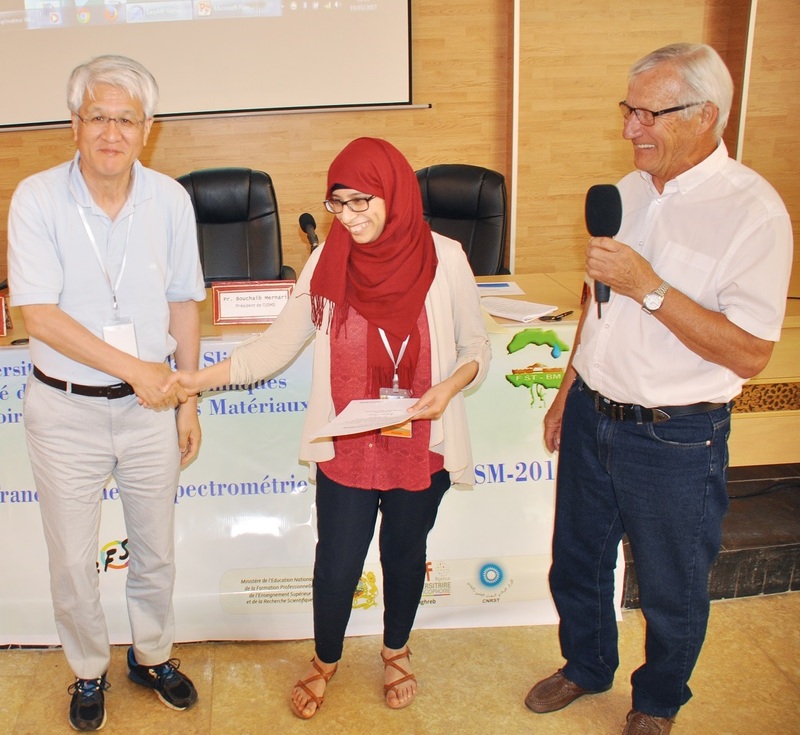 Out of the numerous posters, the GFSM 2017 poster prize (150 €) was awarded to Mohammed Ounacer (University Sultan Moulay Slimane) from the group of Prof. Mohammed Sajieddine. The Dalton Transactions prize was awarded to Houria Benaissa (Université catholique de Louvain) from the group of Prof. Yann Garcia, on thermal sensors based on 4H-1,2,4-triazole derivatives. 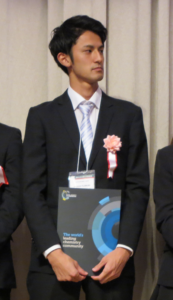 This later prize was delivered by Prof. Hiroki Oshio (Dalton Transactions advisory board member). A GFSM 2017 thesis prize (300 €) was also delivered to Siham Difi (Montpellier and Marrakech) by Dr. Jean-Claude Jumas (Montpellier, poster committee chairman). Dalton Transactions offers a huge congratulations to all the prize winners! 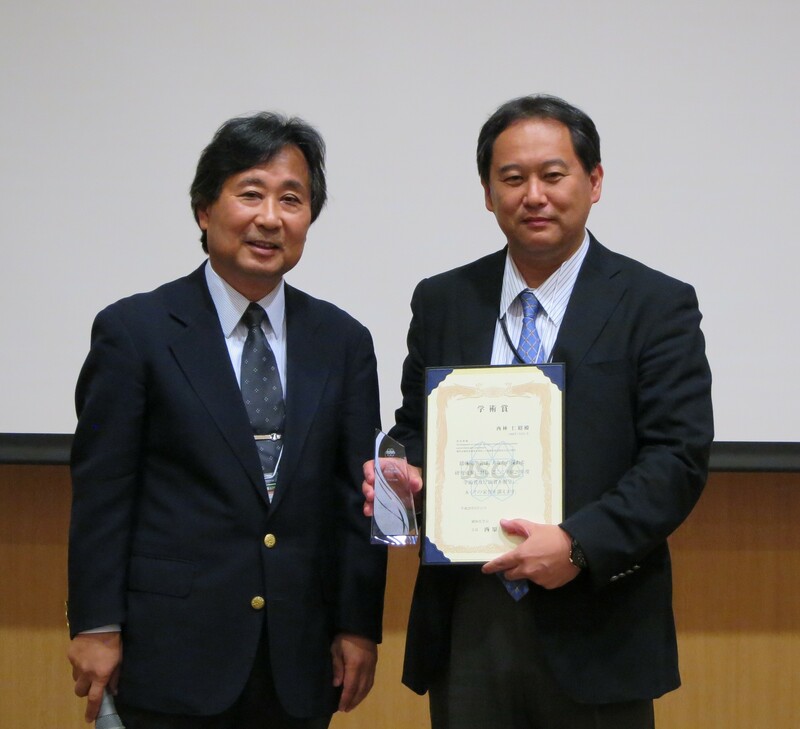 Earlier this year the 67th conference of the Japan Society of Coordination Chemistry (JSCC) was held at Hokkaido University, co-organised by The Chemical Society of Japan (CSJ). Including both fundamental and applied work on synthesis and properties of coordination compounds, encompassing organometallics and bioinorganic chemistry, the event was a huge success with over 1000 attendees. More than 150 talks, in English and in Japanese, were given over three days, including Award Lectures by world-renowned academics, including Omar M. Yaghi (University of California, Berkeley), Yoshiaki Nishibayashi (University of Toyko), Jian-Ren Shen (Okayama University), and Erwin Reisner (University of Cambridge). Congratulations to Professor Yoshiaki Nishibayashi, winner of the JSCC Award for Creative Work! 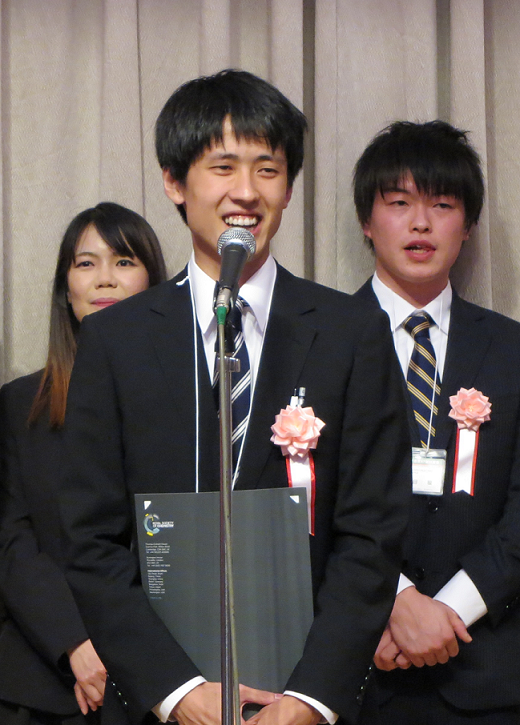 Dalton Transactions is pleased to sponsor the Japan Society of Coordination Chemistry (JSCC) Award for Creative Work. The inaugural award was won by Professor Yoshiaki Nishibayashi, of The University of Tokyo, and was presented by Professor Hiroshi Nishihara, JSCC president, during the recent 67th Conference of JSCC at Hokkaido University. 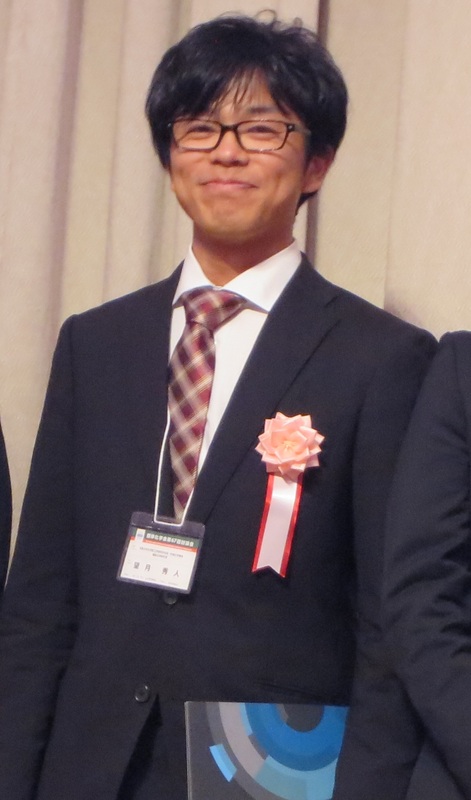 Professor Nishibayashi gave an excellent award lecture entitled Development of Catalytic Nitrogen Fixation Using Transiition Metal-Dinitrogen Complexes. He has been at the University of Tokyo since 2005 and currently has 200 publications to his name. 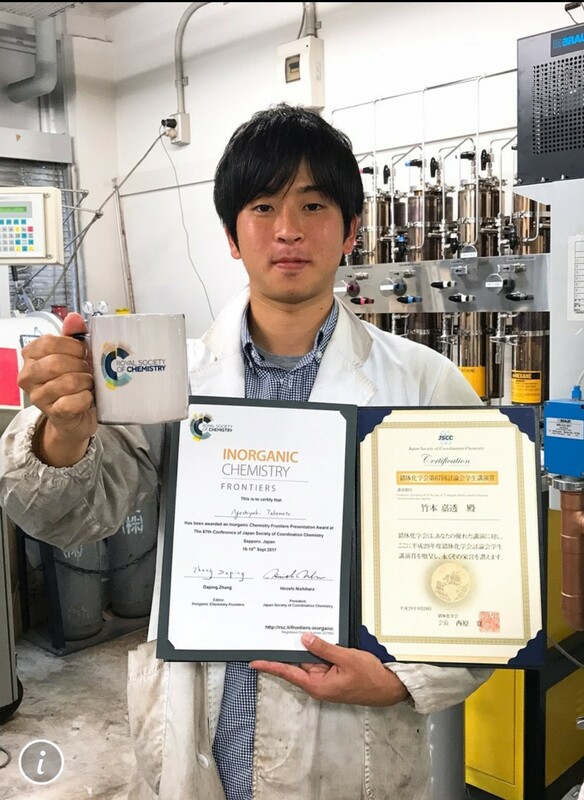 As well as the construction of molecular scaffolds for supporting dinuclear catalysts for nitrogen fixation, Professor Nishibayashi also studies the design and synthesis of transition metal catalysts for organic transformations. More information about his work can be found at his website. 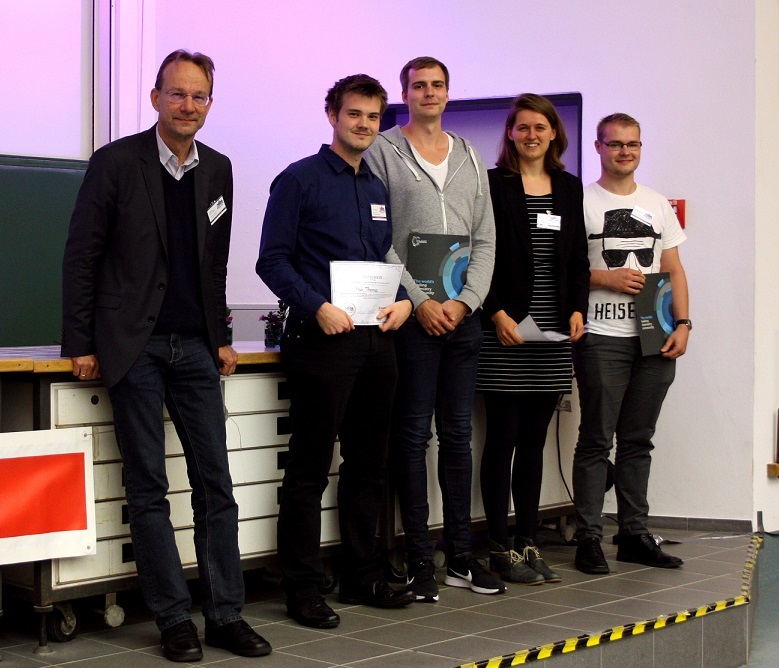 Congratulations to the DYME prize winners! 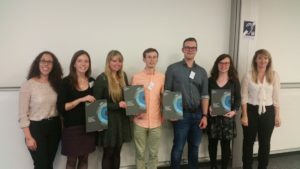 Last week saw the Dalton Younger Members Event (DYME) held at the University of Bath. This is a free biennial event designed to support PhD students and post-doctoral researchers within the Inorganic community, providing presentation and networking opportunities for early career researchers in a relaxed and friendly setting. The event was organised by Dr Jennifer Garden (University of Edinburgh) and Emma Sackville (University of Bath), the post-doctoral and PhD representatives of the RSC Dalton Division, and featured plenary talks by Robin Bedford, Rebecca Melen, and Geoff Spikes as well as a packed schedule of oral and poster presentations by PhD and post-doctoral researchers. DYME alternates years with the Meeting of Inorganic Chemists Recently Appointed (MICRA) which will be hosted by Rebecca Melen next year at Cardiff University.